FILE PHOTO Webster officials are considering laws that would set standards for residential and commercial solar power systems. New York has experienced tremendous growth in solar power over the last several years. Between 2011 and the end of 2015, the number of solar installations — from small residential systems to larger projects — grew from 249 to 1,284 in the Finger Lakes region, according to data from the New York State Energy Research and Development Authority. 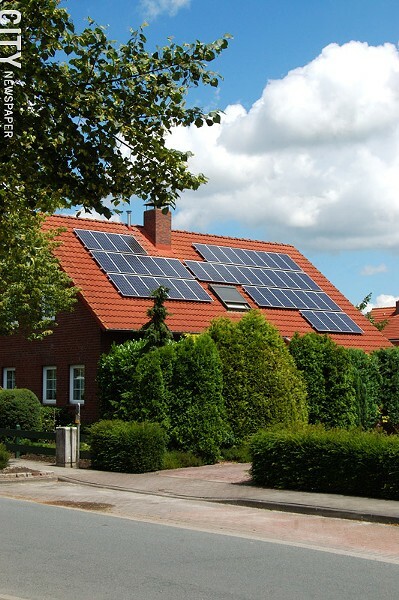 As solar panels get less expensive and more efficient, the technology is becoming more attractive to homeowners, developers, and power companies. For example, in Webster, a developer has proposed a 120-panel development that would sell electricity to the community. The project is on hold while the town considers a draft solar ordinance. The Town Board will hold a public hearing on the ordinance at 7:30 p.m. on Thursday, November 17, at Webster Town Hall, 1000 Ridge Road. The laws would allow rooftop and ground-mounted solar panels in all zoning districts as long as they aren't the property's primary use and they adhere to certain criteria. Ground-level residential systems, for example, can't take up more than 20 percent of a lot and must be at least 25 feet from any property line. The systems would require town Planning Board approval. The laws would also allow large-scale solar-power systems that provide energy for off-site consumption. Those installations would be a permitted use in commercial zoning districts and a specially permitted use in residential lots larger than five acres. The Planning Board would approve the former, and the Town Board, the latter. The laws would also require decommissioning plans for the sites should they ever stop operating. A special permit would be required so the town has some say in the process, says Webster Supervisor Ron Nesbitt. The town's ordinance would not apply to the Village of Webster.